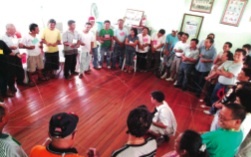 The concept of Sports for Peace was introduced to the Island of Mindanao, Philippines as an alternative approach to conflict transformation and peace building by the GTZ supported “Poverty Reduction and Conflict Transformation” (PRCT) Project team. It was tested in four regions in Mindanao. The Sports for Peace programme links individual skills with the values of sports in order to achieve the goal of conflict transformation/peace building, and eventually a more peaceful environment. Throughout the entire process it is important to bear in mind that the work takes place in a conflict environment, and therefore all activities undertaken need to be conflict sensitive. Before the PRCT team was able to conduct the Sports for Peace programme, the participating community/school had to be selected. This required not only gaining an overview of the existing conflict lines in the area but also applying a simple selection criteria. The communities were chosen according to their willingness to address the conflict they were facing, and in accordance to their available facilities and willingness to integrate all conflict parties. At the same time, it was essential that the communities were willing to end the conflict. They had to assure the PRCT team that they would engage in further conflict transformation/peace building activities even after the Sports for Peace event, which was key to achieving sustainable development. 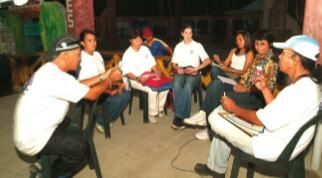 Several community members and stakeholders were involved in the planning process, and as many different tasks as possible were assigned to the participating communities by the team. By doing so the team gained the support of the various people involved as well as the community they were coming from. Being part of the programme made them feel important; this in turn made it easier for the team to concentrate on the issues of conflict transformation/peace building. Furthermore, the team could focus on deciding which activities should be conducted with the students with regards to these issues. As a result of the whole exercise PRCT also elaborated a Sports for Peace manual. The manual aims at providing basic knowledge on how this activity can be used as a conflict transformation/peace building tool. The exercises were carefully selected and tested in the pilot areas. The manual likewise discusses the importance of coordination and other administrative concerns that are equally necessary for the smooth implementation and performance of Sports for Peace. “Preparation, administration and management” dealt with the necessary information for the preparation, coordination, organization and management of Sports for Peace events. All necessary information had been obtained before the team decided when and where they were going to conduct the event. Not only all problems regarding the performance of the event but also issues like providing halal food, medical assistance and transportation for the students and teachers were clarified beforehand. “Looking back to the past” provided a historical perspective of the conflicts in the specific regions of Mindanao. The intention of this step was to help participants understand the history, the nature and sources of conflicts, and the initiatives undertaken to resolve these conflicts. To be able to do this activity properly, first the PRCT team had to become aware of the conflicts the participants were dealing with. One conflict line was chosen along which the Sports for Peace event would be conducted. “Peace Concepts and Activities” was a self-discovery journey aimed at giving the participants a better grasp of peace concepts and principles. 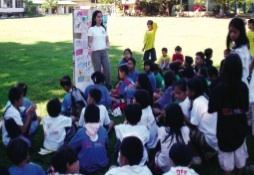 It presented a series of learning exercises envisioned to deepen the children’s understanding of personal peace and societal transformation in Mindanao. “Sports Core Values” discussed the three sports core values focused on by the PRCT team: discipline, teamwork and fair play or sportsmanship. It also presented the sports core value rating system wherein non-playing children observed the playing teams and rated them along the three core values by dropping colored stones in color-coded glasses (“The marble/ stone theory”). By doing so the students were able to value good behavior and the playing students had to think about their results. “Sports Events” was the module where the competitive games in the four team sports of football, volleyball, basketball and Little League baseball were conducted. It presented among others the field and equipment requirements, number of players, and referees and umpires who officiated in the games. This step was the last one where the team got actively involved in. Here the students were able to show what they had learned during prior sessions and to act accordingly. The PRCT team had organized all materials required for the games including: different colored t-shirts as well as the awards for the various teams, which pictured the symbol of peace: a flying dove. Important for the success of the event is that all of the above steps depicted in figure 1 are needed for a successful Sports for Peace event. Each step builds upon each other. The activities which form part of each step were further sub-divided according to the age, mental and physical fitness as well as with a view to the expected outcome that should be reached by the activity. While the stepwise approach proved successful for the events organised by PRCT, they should not be treated as a value-print. The steps need to be adapted and modified according to the individual settings. Proper preparation, management and administration are important in ensuring the smooth implementation of the Sports for Peace event. If any rules are needed for managing the event these more often than not depend upon the persons responsible for the event as well as the general “management” or “organizational” culture of the community where the event is taking place. There is no substitute for a good plan but planning requires time, effort and much thought. A two-month lead-time proved to be a good recommended time span, especially when considering the involvement of several stakeholders and the number of activities to be conducted at the field level. Even though the Sports for Peace activity was set up according to plan there was an urgent need to track and monitor the implementation of the various steps. This included establishing meaningful and effective linkages among various people involved and other stakeholders. It further required an active role by the participants in contributing to the various processes and/or activities to ensure their success. The actual event always went smoothly if there was sufficient time and good planning. Nevertheless, this did not mean that even some of the simplest tasks were not forgotten. When coordination was slack there was a danger that persons assumed that certain tasks were being taken care of by somebody else. As a result, some activities were left unattended or neglected while others overlapped. Caution should be exercised so that in the midst of all the activities taking place one does not lose track and nothing is omitted in the process. Photo 3: There is no substitute for a good plan! What also proved important was to present and discuss with the participants the the historical perspective of Mindanao and it various conflicts. This was necessary in order to enable participants to grasp the complexities and nature of the conflicts that have made peace so elusive. At the same time it was also necessary to discuss the different peace building and conflict transformation initiatives that had been undertaken, highlighting the success and lessons-learnt. Initiate a change in perspectives about the situation in their area/region. Step III involved four modules. These were aimed at providing the participants with a broader orientation on peace concepts and pedagogical principles while developing positive values and attitudes necessary for both personal and societal transformation. The modules were developed using structured learning exercises (SLEs) and other participatory and creative activities that can be done either in classrooms or outdoor settings. The age bracket of participants was considered in developing the activities. Hence, the participants were grouped into three age brackets: 6-8, 9-11, and 12-15 years of age. The SLEs drew learnings and conclusions from the experiences of the participants. A mini-lecture was often given to reinforce positive values that were drawn from the participants’ experiences. In some instances further discussions were actively encouraged to deepen learning and insights. These insights were captured in a reflection paper or a diary that the participants were requested to write. Suggest possible ways on how they can contribute in building a more peaceful community. Personal Peace refers to the harmonious relationship with oneself, with others, with the natural environment, and with God, Allah or one Supreme Being. The issue of personal peace is very basic: unless a person is peaceful, nothing is peaceful to him or to her. Genuine personal peace is supposed to contribute to peace building in societies. No one can claim to be personally peaceful when peace is limited to one’s “well being”, unmindful of existing social conflicts or violence. Thus, personal peace must be linked integrally with social peace. The Convention on the Rights of a Child defines a child as a person under 18 years old, unless under the law applicable to the child the age of majority is attained earlier. While the Convention on the Rights of the Child recognizes 18 years as the upper age limit for children, it permits governments a degree of flexibility by adding the clause “age of majority”. Protection from persecution and to an upbringing in the spirit of worldwide brotherhood and sisterhood and peace. Identify activities that will serve as active and concrete response in promoting children’s rights and preventing abuses against children. Inter-cultural conflict and issues play a vital role in obstructing peace at the regional and national levels. It is important to realize that cultural solidarity is essential and highly desirable for peace. The cultural conflicts that are plaguing Mindanao must be resolved through non-violent strategies. The tasks of the concept were to have the people understand the different cultural values and traditions within Mindanao. This module encouraged people to work together peacefully towards a society which respects cultural differences, while seeking to build cultural solidarity amidst diversity. Identified activities that could serve as active and concrete response in the promotion of the culture of different communities. It is the introduction of these core values which differentiates the way Sports for Peace was further developed by PRCT in Mindanao compared to similar events in other countries. Under the Marble/Stone theory, even at an early age, the children were given the responsibility to choose and decide which teams were best in the three core values through the use of marbles and/or colored stones that they dropped in properly marked glasses. After making their choices, the children discussed the results with their coaches who in return filled up a Core Value Evaluation Sheet based on the inputs of the children. The four sports chosen for the Sports for Peace programs in Mindanao — basketball, volleyball, baseball and football — were team sports that are based on popularity in the localities this concept was applied in. They are also played by both boys and girls and in mixed teams. However, other sports might be organized as long as they are intended at promoting peace and solidarity, teamwork and socialization while establishing the basic foundation of the core values of sports. The sports should likewise recognize individual talent and skills. The games and the way they were played had been piloted in three separate areas among children in different age groups, social standing, gender and beliefs. 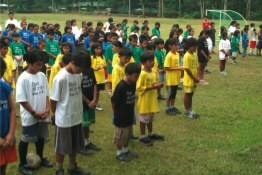 The sports event was the highlight of the Sports for Peace activity wherein the participating students were able to “live” the concepts and culture of peace they had learned. In the sports event, the concept, objectives and guidelines for Sports for Peace as well as the roles of all participants were discussed as these provided the bases of the evaluation and rating after the games have been played. As preparatory activities before the conduct of the games, discussions and workshops were organized to fully explain to all participants the concept and objectives of Sports for Peace. In this section the sports requirements and rules for each sport were the main focus. Preparations before the Sports for Peace event provided exact information about e.g. the size of the field, the number of participants, the rules of the games and some simple examples on tactics. The descriptions used are those general procedures and rules known all over the world. While these general rules were applied, it was sometimes good to simplify the rules to make the sports more applicable to the students. Organizers: As the team manager, club official, competition organizer, or local, regional, national or international administrator, the organizers represent authority and have power. They also have various responsibilities, one of which is to safeguard the public image of the sport to ensure that it prospers and encourages promoting the concept of sports for peace. Players: They hold the key to a fair and enjoyable game. They want to play well, want to win, and want to display their talents and skills by exercising the virtues and the core values of sport. They are the ambassadors of goodwill. Referees or Umpires: Players want to enjoy the game. They must gain the confidence and trust of all players and teachers through fair and firm control over the events. Coaches: They are concerned with the fitness and skills of players to compete in the games. Their concern is also to focus on the design of the Sports for Peace programme which is a combined skill in sporting events and indoor activities on culture of peace to foster among children and youth the spirit of unity, understanding, and solidarity using sports as a mechanism and venue. They influence character building and development of young people at an impressionable age. Teachers: They teach in school, college, university, or any other institution where they have special opportunities to mold and nurture young people of formative ages. Parents: They want the children to enjoy the sport, develop physical and mental health, and behave in a manner which reflects favorably on the family, clan and society. Fans: They support the sport and enjoy the thrill and suspense, the drama and beauty of the game. They are attracted by its colours, athletic grace, and the fun they get from it. Doctors: They are concerned for the physical and general health of the players. They work with nutritionists, parents, teachers and coaches. They are concerned about the general welfare of the players. Journalists: Whether they are a part-time or full time journalist or a reporter or commentator for radio, TV or film, any sport needs their help to keep the game colorful, attractive and exciting. Throughout the whole process the sustainability of the different events was monitored by the PRCT team on a daily basis. Regular feedback sessions helped to continually improve the events and include the community and students in the set up of the Sports for Peace occasions. At the end of each event the team evaluated the entire process, and noted changes and improvements to be made for the next Sports for Peace event. In order to attain enhanced sustainability of the whole programme the teachers were asked to present their revised timetables to the team including the lessons they wanted to pass on to their students. The PRCT team offered to assist the teachers in setting up trainings on further conflict sensitive approaches as well as help train the studusing peaceful conflict transformation tools. behavior and attitude. Only if Sports for Peace becomes a regular and long-term recurring event can it make a sustainable impact on conflict transformation/peace building. Nevertheless, the successfully implemented Sports for Peace events revealed that sports can become a powerful tool to deepen the children’s understanding of the core values of discipline, teamwork, sportsmanship and fair play. The PRCT supported events highlighted that practising these values during sports events achieves a greater impact compared to the traditional frontal teaching approach. learned and behave accordingly. The children thus learn the importance of transparency and wise decisions. In general, the Sports for Peace programme provides children the opportunity to play and enjoy the games, interact with other children to exchange ideas, develop friendships that cut across borders, and engage in friendly competitions. More importantly, they learn that even in diversity, people with different beliefs, practices, origins and languages could embrace each other, engage in the same activities and work together to achieve common goals. These activities promote peace and solidarity, teamwork and socialization while establishing the basic foundation of the sports core values and recognizing individual talents and skills. What is important is to develop mechanisms to sustain the events over time since single, isolated events by tachieve the long-term aims and objectives.